We were still camped at the Midway Campground in Big Cypress National Preserve. And after being rained out on our bike ride around Shark Valley six days ago, we decided to give it another shot on this gorgeous day. We drove east to Shark Valley. They had put up the "Parking Lot Full" signs and there was a line at the entrance booth. The parking lot is pretty small for such a popular place. So, we turned around and parked out on the side of the Tamiami Trail where we noticed others were parking. We took the bikes off the rack and rode them into the park. I had my receipt from last Friday which was good for seven days, so we just showed that and went right in. It was a nice day, and our main goal was to ride the 15-mile loop for some exercise and walk the three trails. But it didn't take us long before we were off the bikes taking pictures and videos ... again. Last week, we were thrilled to get glimpses of Purple Gallinules. Today, we saw about a half a dozen out in the open. 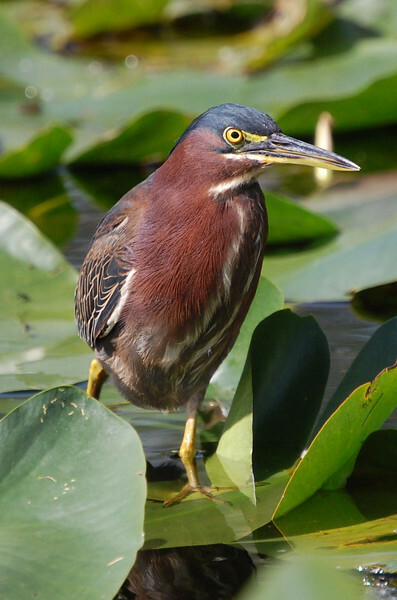 Linda took this video of one of them with a Green Heron. 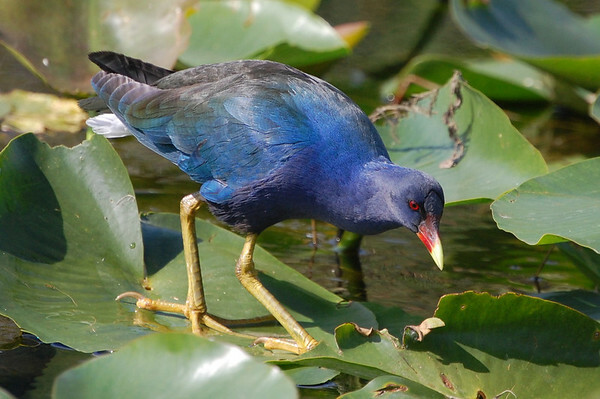 The Purple Gallinule has extra long toes making it look like it has oversized feet. But they are perfectly designed for walking on the lily pads. Now, it was our intent to just enjoy our ride and the wildlife and not take too many pictures today. 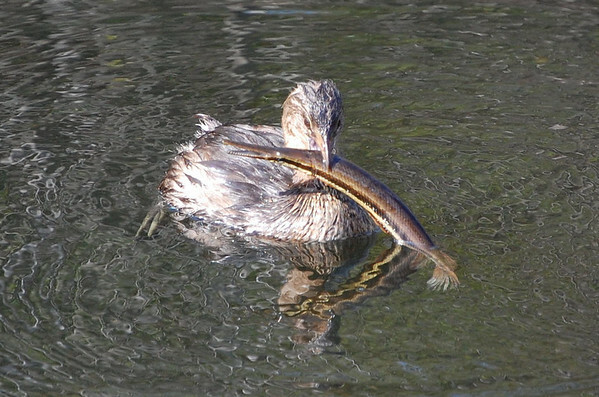 But there were some things that just had to be photographed ... like this Pied-billed Grebe with a very big fish ... for a grebe. There's more to the story. This grebe popped up in front of us with the biggest fish we've ever seen a grebe catch. 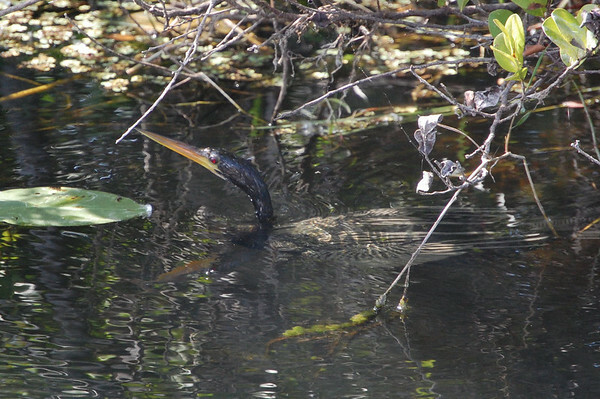 Well, it also popped up in front of this Anhinga. 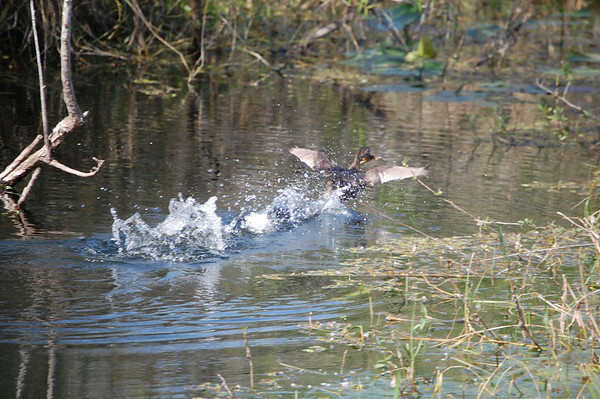 As soon as the Anhinga saw the fish, it went after it. But the grebe did its "grebe thing" and walked on water to get away and save its catch. By then, Linda had the video camera out and she captured this fascinating footage of the grebe releasing and re-catching the fish. Welcome to Wild Kingdom with Howard & Linda. was this tiny bird that we didn't see the last time we were here. 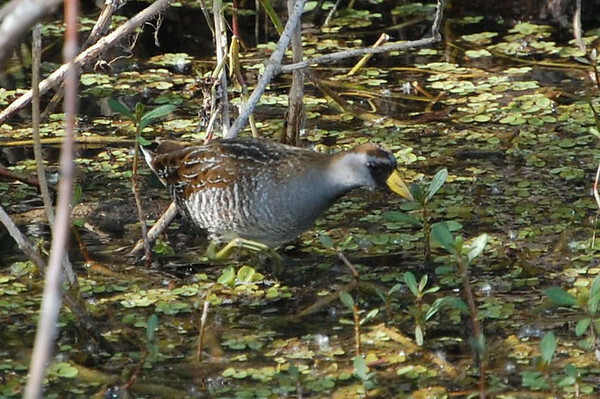 That's a Sora. Hadn't seen one of those in over two years. Okay, so we were able to put the cameras away for quite awhile. 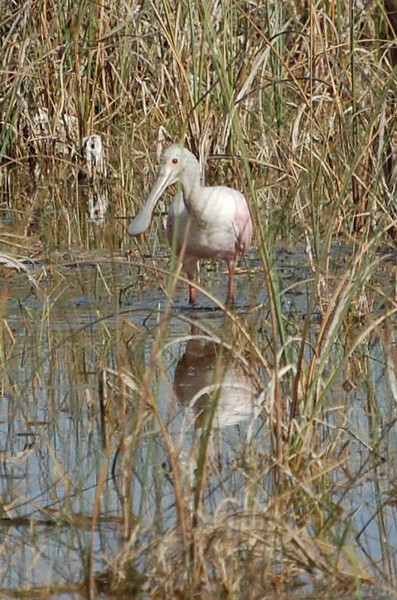 But, eventually, I had to get a couple shots of the Roseate Spoonbill. This one wasn't quite as bright pink as the ones we saw the other day when we got rained out, but it was the best we could do. They are very interesting birds and they are beautiful in flight with their bright pink plumage against a green mangrove background. Okay, so near the visitors center is the Bobcat Trail. We didn't see anything special there. And a couple miles down the road is the Otter Cave Hammock Trail which is a .25-mile trail that has some interesting holes in the limestone, but with quite a bit of foot traffic, there wasn't anything to see today. So we were down to our last trail, the Borrow Pit Trail at the end of the West Road on the path leading to the observation tower. 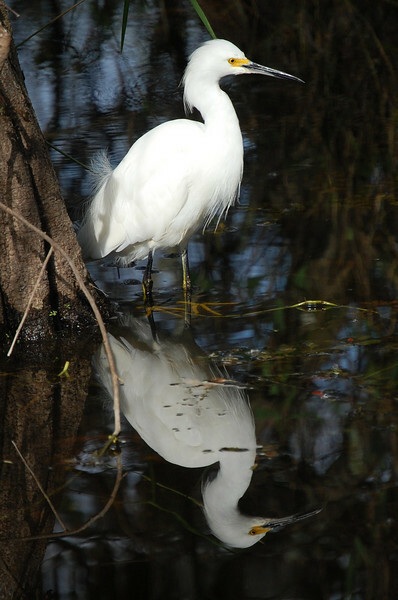 I took this shot of a Snowy Egret in one of the pit ponds. But, just beyond that, we ran into a little problem. 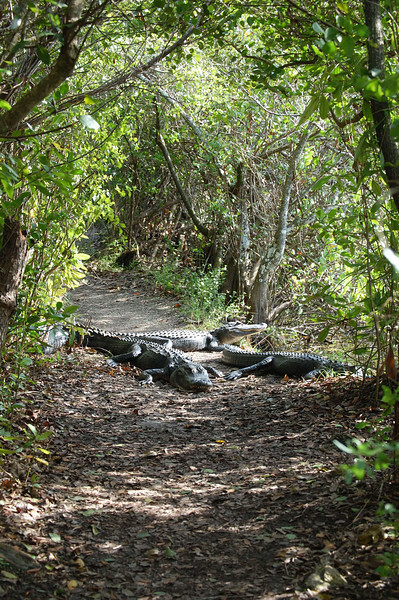 Yep, a few of the local residents decided that this trail was closed. I had resisted taking any alligator photos all day ... until then. Since there was nowhere to go around, I'm afraid we can't tell you anything about the rest of that trail. So we got back on our bikes and rode along the 8-mile east side road back to the visitors center. Though we were following the rules and riding against the tram traffic, it's easy to see why many people ride down the West Road and then back up it again instead of completing the loop. 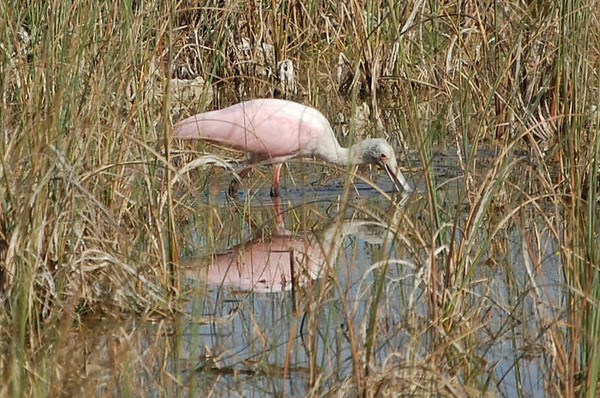 There is much more to see along the canal than out across the grassy everglades on the east side. Don't get me wrong, the east side is pretty cool if you haven't already been spoiled by the west side. 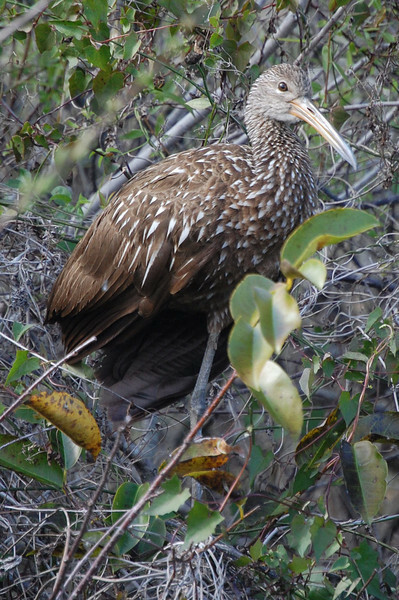 In fact that West Road in Shark Valley pretty much spoils you for all your wildlife watching in the "glades". It's a bird, turtle, and alligator photographer's paradise. The animals are so used to people, you can get closer than anywhere else. And the variety coupled with lots of natural feeding and territorial activity make it a great place to spend the day. It was a great day with much less wind than last Friday, and we got in our exercise, walked a couple trails, and saw some interesting sights. If you enjoy wildlife, Shark Valley is like a natural zoo where you can get closer to the animals than in a "barriers and bars" zoo. Sometimes, a little too close for comfort.